Since Ella Mae&apos;s Boutique opened its first Brownsburg storefront last year on South Green Street, it has been my go-to store when I need a cute, fashion-forward outfit. Now, Ella Mae&apos;s is bigger and better than ever in its new location at 19 N. Green St. in Brownsburg, in the town&apos;s only original downtown building. When I stopped by the store the other day, I loved everything about the new location, from the fall decorations and chalkboard signs welcoming customers outside, to the wood floors and exposed brick walls inside. The new location feels much more spacious, and I found it easy to browse the neatly-organized racks of skinny jeans and leggings, tunics, dresses, accessories, and more. The only problem? I wanted to take home the whole store. 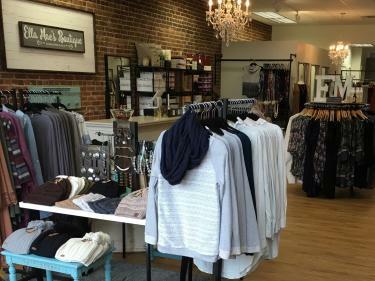 Fortunately, the clothing and accessories at Ella Mae&apos;s are affordable for the average family. I had an opportunity recently to chat with the owner, Abby McKinney, and it was so exciting to learn about her plans for not only this new location, but also the old location on South Green Street. McKinney, a Brownsburg mother of four, plans to turn the old Ella Mae&apos;s location into a baby and maternity boutique called Mase & Gave. McKinney said she loves the charm of the house on South Green Street, and didn&apos;t want to lose the location. Mase & Gave, which is named after two of her sons, is scheduled to open Oct. 29 at 33 S. Green St. The store will have baby clothes for newborn through size 2T, maternity and nursing clothes and lots of gifts for babies and expectant families. In the future, McKinney also plans to open a shoe store named Haiden Shoes after her son, Haiden. I have no doubt that Mase & Gave, and someday Haiden Shoes, will be just as successful as Ella Mae&apos;s.
Next time you&apos;re in Brownsburg, be sure to stop at Ella Mae&apos;s Boutique to find the perfect outfit for your next event.